We're big ocean animal fans around here thanks to Nemo . What animal we are most interested in changes on a daily basis. Sometimes it's about the clown fish, other times whales and then we can go on a jelly fish kick. Currently we're all about the sharks (which thankfully make an appearance in some of the following books!). This past week Bookworm1 has been sick, sick, sick and so we were delighted to have some new ocean books to read and pass some time with. We started with If a Dolphin Were a Fish and it was an instant hit. Bookworm1 LOVES to compare things to one another. That seems to be his way of connecting with the world around him. "Does it move like a crane?" "Does it look like my hand?" He compares and contrasts like nobody's business. This book fit the bill for his way of thinking! 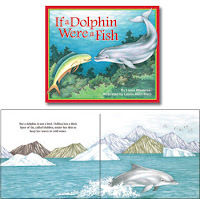 It focuses on a dolphin named Delfina who wonders what it would be like if she were another type of animal. If a dolphin were a sea turtle, Delfina would lay eggs on the beach. But a dolphin is not a sea turtle. A dolphin does not lay eggs. Instead, a dolphin gives birth to her calf underwater. Awesome. He LOVED this book. Next we moved on to Ocean Seasons which takes a look at what is happening underneath the waves as the weather changes. All of the illustrations focus on a particular area of the ocean. An island is included in the landscape so that the kids can get a picture for what is happening both on land and under water over the course of a year's time. Spring is a burst of color on land and in the sea plants spread their soft, new growth. We meet all kinds of sea creatures, such as diving birds and seals who are dining on fish that live in the kelp. We also learn about whale migration during the colder months. I really appreciate how the book handles changes in the weather and how animal habitats are effected just like ours are. It's a fun way to look at weather, as well as sea life! 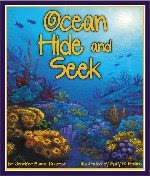 Lastly, we read through Ocean Hide and Seek which is told in rhyme. This is the most interesting Hide and Seek book I've ever seen and it's due in great part to the artist talent of illustrator Gary R. Phillips. Instead of bright pages full of color and ...things...he uses dark colors so that you have to look closely at the page to make out the outlines of the fish and underwater creatures. Still, it's not impossible to see the fish at all. Certainly no strain on the eyes. But the way that he illustrated with heavy use of blue and black (and yet the art is not simple by any means - they are lovely pictures) catches you off guard. As you turn the pages, you almost feel like you walked into a dark room where you can only make out shadows and you are reaching for a light switch. I don't feel like I can do his illustrations justice, except to say that they "really good." Not to leave out mention of the author, she wrote the book in rhyming fashion with lots of repetition. Her words are written in such a way as to give the reader a feeling of rocking in the ocean. Really, this is a book that you feel and experience more than just read. It's really intriguing and different. I love Sylvan's books as well because they are sturdy, well-made and the pages are glossier which helps bring the illustrations and animals to life. If you haven't had an opportunity to check any of their books out - do! I think you and yours will enjoy them very much. I know that we do. Woah! Blast from the past! I absolutely adore children's books, so thanks for this. I had forgotten how beautiful the art is and how creative the text can be! I was just thinking about looking for beach/ocean books last night! Thanks for giving me a place to start looking! Neat! Thanks for introducing me to a new line of books. The one with the darker pictures sounds especially cool. The only shark book I know right off the bat is Big Shark's Loose Tooth. It's more about teeth (and tooth fairies) than sharks, but it popped to mind. Hey--Just before rest time, we read a tall tale/legend that involved an Eskimo (?) and all manner of sea life. These books look FABULOUS, Carrie. I'm definitely going to have to look up this Sylvan Dell company for future studies! As always, I'm so glad you're playing!